Often in my collecting life I’ve wondered that title question – Why did I get that? What on earth possessed me to go out and buy that specific watch? Was it because I just liked the look of it, or perhaps I wanted an example of that type of model. Maybe it had a feature or function I was particularly interested in or could it be it was one of those milestone watches. Or one of those models that defines and stretches the technology of the day. So many reasons I suppose and many with some merit I’m sure too, but this one I’ve featured here has to be just a one off, an aberration perhaps. One of those instances where I just lost it for a minute and did that “no no”, the impulse buy! 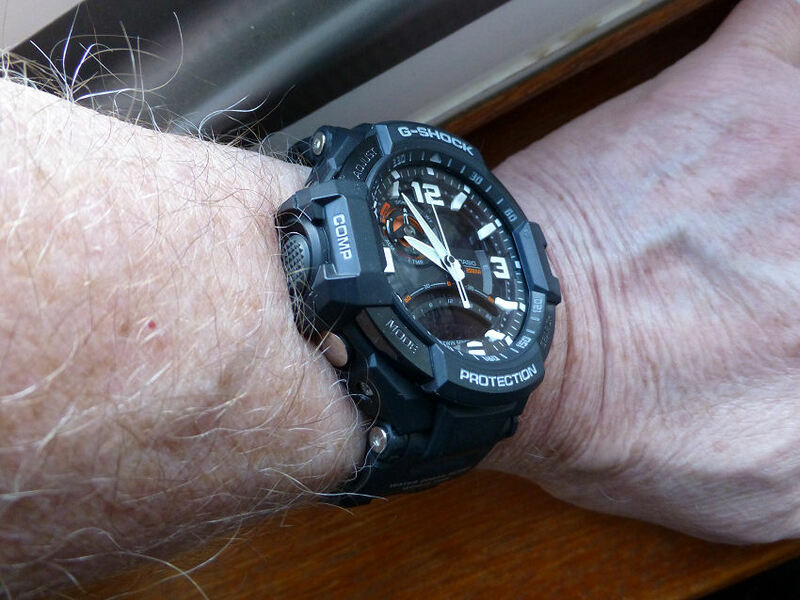 Because this watch is quite frankly and on my relatively average wrist – and as we say in the UK – this is one big sod! Quite overly big in every way, mostly unnecessary too as the function set, whilst OK is nothing particularity spectacular. Digital Compass, World Time, Stopwatch, Chronograph, Timer, Alarms plus good night lighting it has to be said. But no Solar and no Radio Control. Lots of physical protection, though this increases the dimensions so much that the protection is in itself an attractor of damage. It gets in the way. 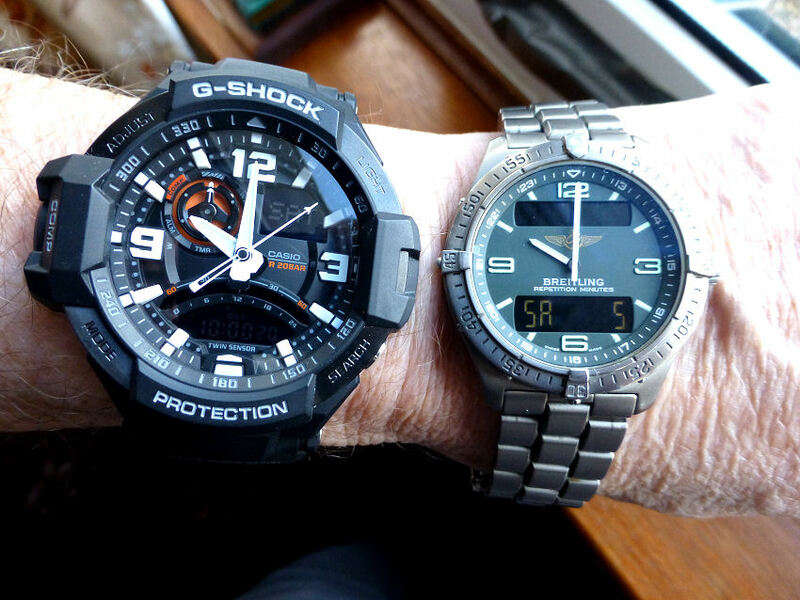 One big mother compared to my old Breitling! But that said the watch is amazingly comfortable to wear – it doesn’t feel big as it is so light on the wrist and I like wearing it. It’s also quite easy to read as the analog is clear, the numerals are large and actually the small digital windows are OK and I can make out the Day, Date, Month without much trouble. And it’s got a great strap, light and flexible with a twin hasp buckle fitting, though some might find it a little short. Is that ironic or what on that is after all a big guys watch! 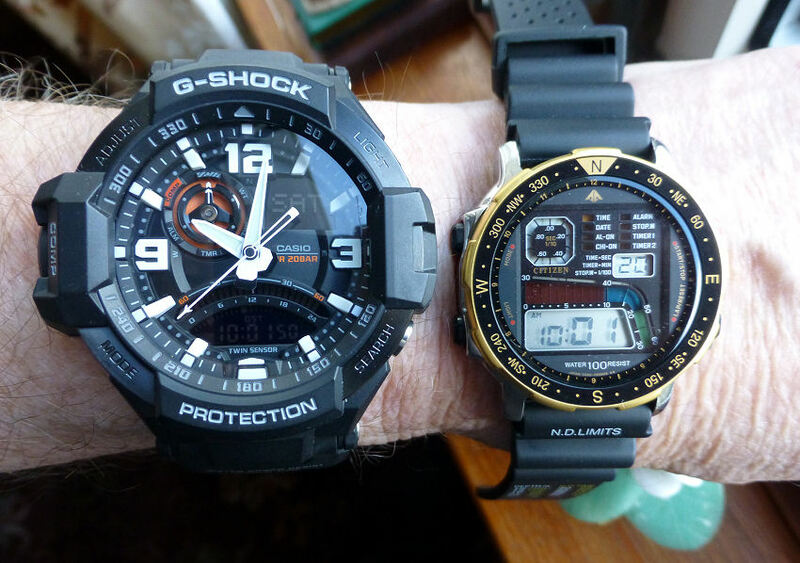 So I took it out of the display box the other day, as I was considering moving a few models, selling them on, to make way to finance a new watch genre for me. But funny how these things work out, once I had it in my hand then on my wrist, I realized that for some unaccountable reason, I really quite liked it. In fact that was three days ago and it’s still here on my wrist as I write, so what on earth is this all about? It’s back to that question – Why did I get that? Why indeed you may say and with good reason. It is the very first reason I mentioned at the start of this little blog – I just liked the look of it. Size had nothing whatsoever to do with it, because it just look really good! What can I say? A big mother it is, but do I want to move it on? Mmmm – I’ll have to think on that just a bit longer . . . . . . . and in the meantime I’ll dig out a few of my lesser models and pack them up ready for auction somewhere, though the one I’ve just packed is actually a smart looking watch and you know it looks really good on my wrist . . . . . mmmmm . . . . . .